Carolyn Keene- 60+ books, the Nancy Drew series. The first book series I fell in love with! 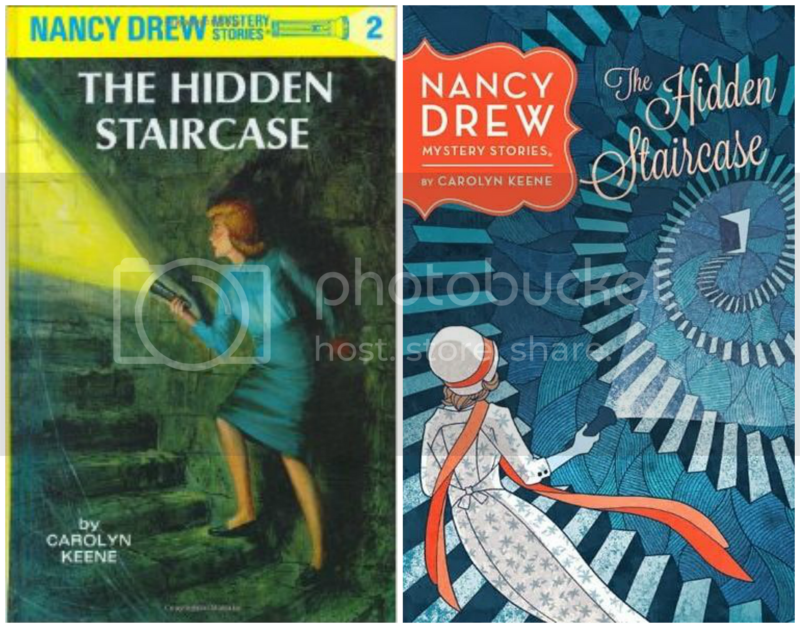 The Hidden Staircase was my first chapter book and I remember picking it out at Barnes and Noble with my dad when I was 7; it was his suggestion! I read Nancy Drew books throughout my childhood and must have read anywhere from 60-100 of them. I loved mysteries! Clive Cussler was my high school obsession! I bought a box of 9 books on eBay and worked through those first. They are formulaic but written well and oh so much fun! The mixture of history with action and adventure plus the focus on oceanic exploration make Dirk Pitt seem like Indiana Jones mixed with James Bond and Jacques Cousteau. My favorites: Sahara, Inca Gold, Shock Wave, Atlantis Found. Ohhh Redwall. 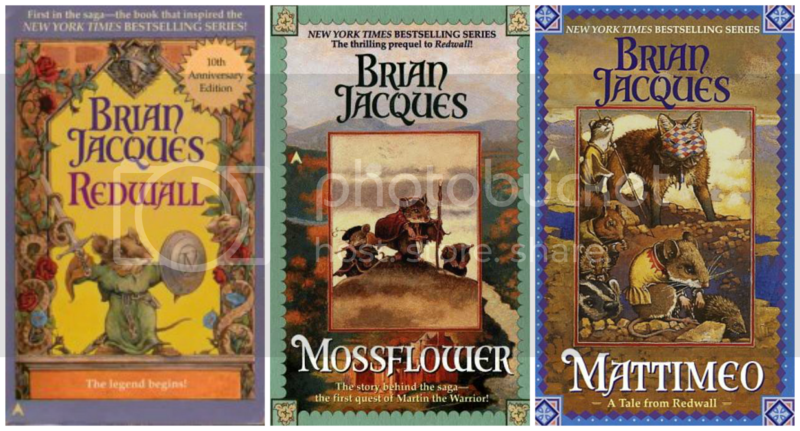 Redwall was my middle school obsession :) My mom bought me the first book in the animal medieval fantasy series and I just loved them. I read 13 of them from the summer before 8th grade through the end of the year. The attention to detail for the Abbey’s history, as well as the multitude of interesting animal cultures, made them such enjoyable reads! Plus I liked how the books connected. Dastardly villains, climactic battles, ancient mysteries, and friendship made them very epic fantasies. I’d like to read the rest of the series someday. 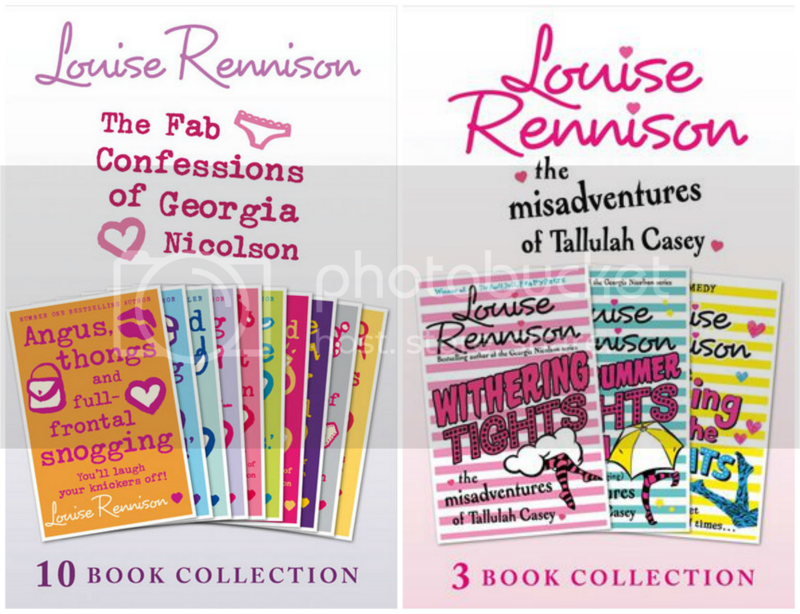 Louise Rennison- 13 books, the Georgia Nicolson and Tallulah Casey series. Oh my goodness, my friends and I were SO INTO the Georgia series! All the hilarious slang, the many laugh out loud moments (I’ve read the first book 4 times), and of course all the BOYS. Sooo many marvy boys; Dave the Laugh and Georgia are my OTP. I read 5 of them in high school and got the rest at the library years later. Still so funny! I love her Tallulah series as well (she’s Georgia’s cousin); they have their own wacky charm and yummy boys. Totally absurd, silly, British, lovely books. Ooer. My favorite high school history teacher gave me my first Daniel Silva book; we had bonded over a shared love of Clive Cussler and he thought I’d like this series. Now my dad and I are both addicted! Gabriel Allon is an art restorer/Israeli spy with a haunted past and oh my goodness are these books tense! There is always an art history angle mixed in with a very 24-esque race against time against a variety of art dealers/terrorist groups/etc in exotic locales all over the globe. They can be read as standalones but the characters and their relationships carry over from book to book so it’s more rewarding to read them all. I’m excited for his newest adventure The English Girl! Sophie Kinsella- 11 books, the Shopaholic series and various standalones. My go-to author for adult contemporary romances! 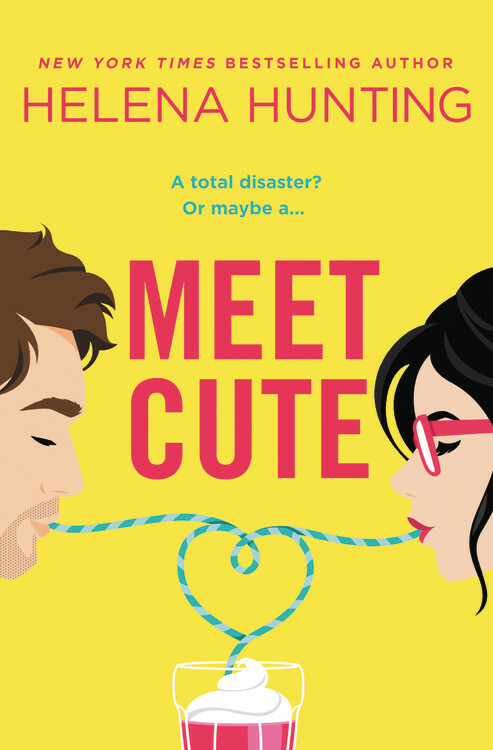 I like to call them romantic comedies because they are hilarious and zany and romantic, and if one of the books was a (good) movie, I’d watch it a million times! Becky Bloomwood from the Shopaholic series is like a British I Love Lucy. And I love the heroines of her standalones as well, especially I’ve Got Your Number and Twenties Girl. Kinsella has a style that I adore; I think I’ve only read one book of hers that I didn’t care for out of 12, which is a pretty fantastic ratio! These need no explanation. I read the first book at the end of 7th grade and waited (not-so-patiently) for each new book! I also counted Tales of Beedle the Bard, Quidditch Through the Ages, and Fantastic Beasts and Where to Find Them. Such fun additions to the Harry Potter canon! I read the first book in this historical spy romance series when it first came out and rediscovered them about five years ago. I went on a pretty serious library binge, I couldn’t get enough! The last book in the series (#12) just came out this month, so I’m excited to catch up on the few that I’ve missed. 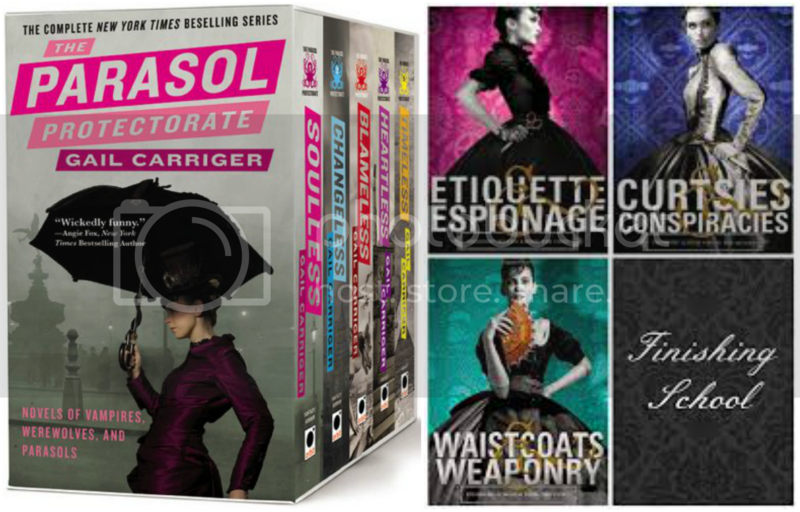 Gail Carriger- 8 books, the Parasol Protectorate and the Finishing School series. Her steampunk books are so much fun; I binge read the Parasol Protectorate and am anxiously awaiting Manners & Mutiny, the conclusion to the Finishing School series. I need to start Prudence (her third series) as well! These books are pretty indescribable. I read them all a few summers ago and can’t wait for the next installment. Set in an alternate Britain with time travel and the ability to actually enter books, they are wholly original, genre-bending books with very likeable and interesting characters. Thursday Next is an engaging heroine, and a literary detective to boot. I love the mixture of fantasy, detective novels and parody. Plus there are a lot of jokes and allusions for fans of literature and reading. The books are fantastically absurd and hilarious. So wild how most of these authors could’ve been on my list, especially if I had stuck to more recent times. However, over my lifetime, my TTT is sort of lopsided in favor of more prolific writers rather than especial brilliant authors who might write less. This was a hard top ten for me to figure out just how to decide how to qualify why certain authors made it on the list. I cannot believe I didn’t include Gail Carriger or Jasper Fforde. This list stinking messed with my mind! Dangit. Lists are always tricky! And I always end up forgetting something. These really are my most read though, I guess I don’t read very prolific authors! I need to catch up with the Finishing School series and Thursday Next! I absolutely adore both Gail Carriger and Jasper Fforde’s books, but I’ve managed to fall behind and it’s been so long I think I’m just going to have to go back to the beginning and start again. Tragic! :) Great list and some really wonderful authors! That always happens to me! They are such fantastic authors, I think you’ll enjoy all the books :) The Thursday Next ones get a bit uneven later in the series but they’re all worth reading. Such an inventive world. Thanks for commenting Rosy! OOh nice! If I wasn’t so behind on Gail Carriger’s books, I so would’ve added her to my list! Great picks! The only author we have in common is Rowling! I’ve not read any of the others. Impressed you’ve read 60 from the same author! To be fair, Nancy Drew books are around 160 pages each probably haha. But that’s a long book for a second grader! And I read almost every Nancy Drew I could through elementary school. Rowling should be on every list hehe :) Thanks for commenting Kristen! 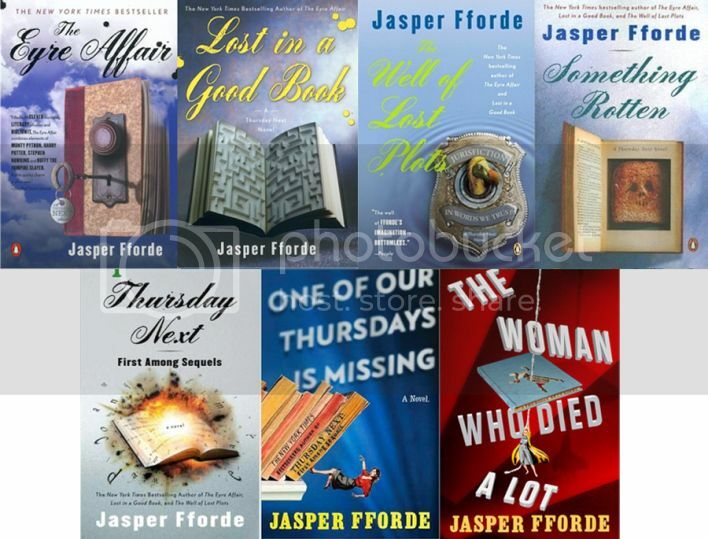 Jasper Fforde nearly made my list too! I need to read the 2 latest Thursday Next books yet, though. Oooh Gail Carriger is on my To Read list already. Makes me want to start one of her books now. I read Nancy Drew when I was younger, too. Loved those books! Have you read Finding Audrey by Kinsella yet? I really liked it. Definitely made me laugh out loud. I feel like so many of us have J.K. Rowling on our lists this week!! That woman writes pure magic! ;) I haven’t heard of some of these, but the Finishing School series is on my TBR. Great list! Ah!!! What a great list! I left Nancy Drew out but I could have included her. I want to start reading Lauren Willig! 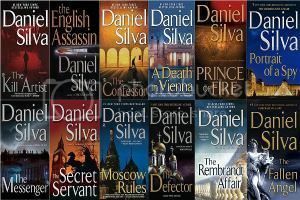 Also, the Daniel Silva books look intriguing… I bet my dad would like those too…. I can’t BELIEVE I forgot all about Nancy Drew books today. UGH! lol. I’m sure I forgot plenty but those are definitely etched in my brain haha! I should have added Gail Carriger to my list! I’ve read 8 of hers. I seriously need to do some honourable mentions or something because I seem to have read 8 books from a lot of authors. 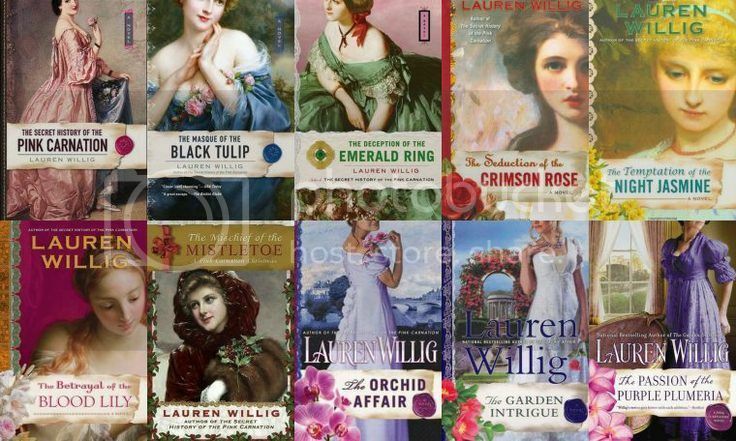 I haven’t read most of these authors but Lauren Willig is one of them! I don’t see many bloggers talking about her, but that series is just so much fun! Nancy Drew! I read so many of those books (and then learned later in a college class that I’d be reading the 1950’s rewrites and none of the 1930’s originals, which were much less…passive). I’ve only read one Thursday Next book, but it was definitely an experience. I’ll have to get back to that series eventually. Oh goodness, I read a bunch of the Nancy Drew novels when I was younger too! I loved solving the mystery right alongside her, even when she got into scary situations. Have you ever played the computer games? I loved that too! Not sure if I ever guessed any of the twists but it was fun to try. And I was always dying to find a secret locket or a lost letter in the attic haha. I haven’t but I know of them. I wasn’t a big computer game kid, that was more my sister :) I tried Carmen Sandiego though! I have always wanted to try Gail Carriger’s books, but I just haven’t gotten around to it. I love the description of her novels, and I would love some more steampunk in my reading diet. OMG I have literally just gone through this list and added almost everything to my TBR! I really wish I was younger so I could read the Nancy Drew books. I missed that train growing up and I just won’t get the same thing from them as an adult. Great list!